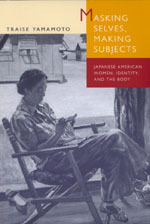 This sophisticated and comprehensive study is the first to situate Japanese American women's writing within theoretical contexts that provide a means of articulating the complex relationships between language and the body, gender and agency, nationalism and identity. Through an examination of post-World War II autobiographical writings, fiction, and poetry, Traise Yamamoto argues that these writers have employed the trope of masking—textually and psychologically—as a strategy to create an alternative discursive practice and to protect the self as subject. Yamamoto's range is broad, and her interdisciplinary approach yields richly textured, in-depth readings of a number of genres, including film and travel narrative. Looking at how the West has sexualized, infantilized, and feminized Japanese culture for over a century, she examines contemporary Japanese American women's struggle with this orientalist fantasy. Analyzing the various constraints and possibilities that these writers negotiate in order to articulate their differences, she shows how masking serves as a self-affirming discourse that dynamically interacts with mainstream culture's racial and sexual projections. Traise Yamamoto is Assistant Professor of English at the University of California, Riverside.